Berean Baptist Church began on Easter Sunday in 1958 with a handful of faithful, Bible-believing Christians who desired to exalt Christ, to preach the Word and to live out the gospel in their everyday lives. Those early years were a wonderful mixture of joy and struggle. Our first pastors were considered "missionary pastors," and many of them worked a full-time job in addition to their responsibility of pastoring the church. During Berean's first nine years, six different men served the church as pastor -- an average of one new pastor every year and a half. 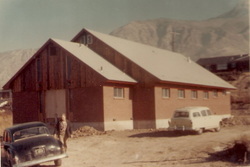 But our church was growing, and in 1963 we moved into our current building on Jackson Avenue. God blessed the church with longevity in the pulpit after that first decade. Our seventh pastor served for eight years and our eighth pastor for fourteen. In 1990, Berean Baptist Church called Mark Short as pastor. Pastor Short served the church for eleven wonderful years, marked by unprecedented growth and a wonderful spirit of service for God. In 2001, just two days after 9-11, tragedy struck. Pastor Short and his family were on a Mission's Trip in Fiji, unable to return to the United States because of restrictions on air travel. With some extra time on their hands, Pastor Short decided to take his boys to play in the ocean. In a span of ten minutes, ten foot waves turned to thirty foot waves, and Pastor Short was carried out to sea, never to return. One month later, in October of 2001, Berean called Dave Mallinak to serve as our tenth pastor. Pastor Mallinak moved to Ogden in 1997, initially to teach in our Christian Academy. Soon after his arrival, Pastor Mallinak became Pastor Short's assistant pastor, a capacity he filled for four years. He and his wife Belinda have five children. According to Acts 17:11, Paul praised the believers in Berea because they "received the word with all readiness of mind, and searched the scriptures daily." At Berean Baptist, we desire to follow the example of these early Bereans. We strive to live by the whole council of God. We want to help others do the same. In every service, in every song, in every message, and in every ministry, we strive to exalt Christ and magnify His name. He must increase, we must decrease. We are a church that loves God and endeavors to honor Him in all that we do. We want to model the Biblical Christian life in all that we do. We believe that it is our solemn duty and our singular privilege to preach the gospel and extend the love of Christ to a lost and dying world. We strive to fulfill the Great Commission in our area by living the gospel and by proclaiming it to others. As the Great Commission is not complete until we have taught others to "observe all things" that are found in Scripture, we make every effort to be thorough in making disciples for Christ. Our church emphasizes faithful preaching, ministry and service, hospitality and love for one another, separation from the world, and holy living. We believe that this emphasis necessarily requires the solemn practice of church discipline (Titus 3:10-11; Matthew 18:15-18; Romans 16:17; 2 Thessalonians 3:6, 14). We emphasize the Biblical doctrine of man's innate wretchedness and sinfulness against a holy and righteous God. We believe that salvation is the gift of God, whereby a sovereign and holy God extends His free grace to unworthy sinners. This free gift of grace is received by faith alone, which consists in simply receiving God's gift and resting on Christ alone for our salvation. We believe that those who receive God's gift of salvation neither want nor deserve any of the credit for their salvation, and particularly that God does not give this gift because of any good thing that He sees in us. All glory belongs to God alone. Those who believe have only God to thank, and they should thank Him. Three times a week, we gather to worship God, to thank Him and to hear His Word. Our goal in every service is to worship the Lord in the beauty of holiness and to give Him the glory that is due to His name. If you long to worship God, to hear His Word preached, to serve the Lord through a local church, to grow in sanctification and holiness, and to be accountable to a body of committed believers, then we invite you to join us for our next service!